We can't get good pho in KK (although that is about to change; more about that soon) and whenever I go overseas, I tuck in a bowl or two. 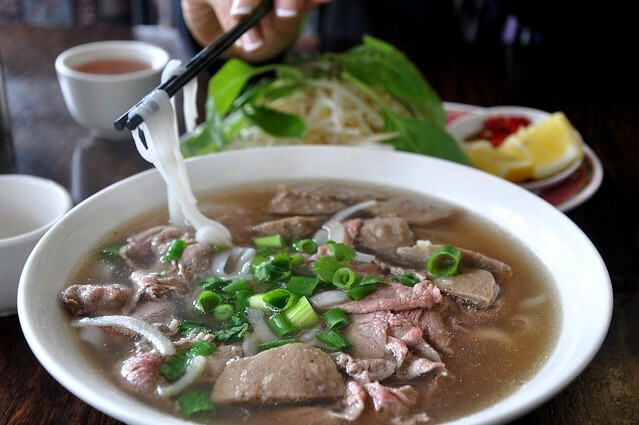 I ate my first bowl of pho in Vancouver, then HK, then Oz but I've never been to Vietnam for the real thing. On cold days, pho is comfort food. Cheap too, since a large bowl can feed a mother and daughter obsessed with loosing that one kg. There are a couple of good pho restaurants on Swanston St in Melbourne but Yi insisted that the pho in the Vietnamese area of Footscray is the best so one rainy noon, we went to Footscray to check out the market (which is amazing. You can sample all the fruits there, no need to buy) and the pho. Every restaurant in Footscray seems to specialize in pho and we decided on one just because we were tired and because there was a newspaper cutting of a good review of the restaurant. 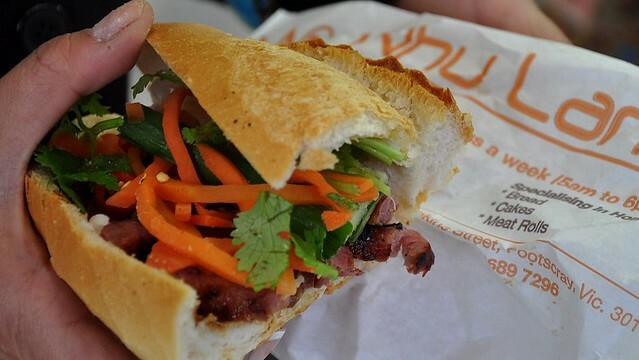 But before the pho, Yi said I should try her fav Vietnamese baguette sandwiches from one of the Vietnamese bakeries. The baguette was excellent, even crispier and crustier than those I ate in Europe, probably because they were fresh out of the oven or re-heated. I didn't like the filling as much but maybe it was because I expected better. 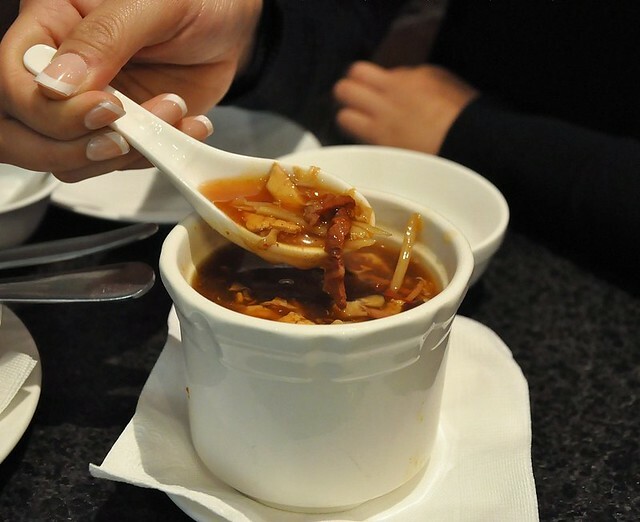 Pho tastes like pho, whether it's in a downtown restaurant or one in Footscray. I wasn't impressed. If I hadn't eaten pho in Paris, I would'v been happy with this. Truly, the pho in Paris was the best I've ever eaten and the biggest difference was in the soup. I repeat: the most important thing is the soup. 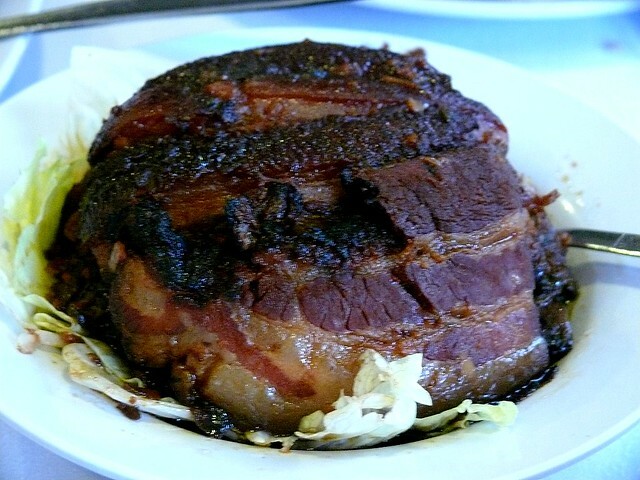 It's got to be thick, robust, full of beefy flavor. 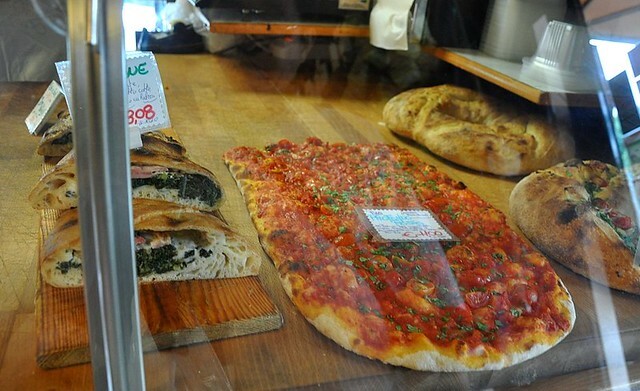 Window shopping in the city and hungry? 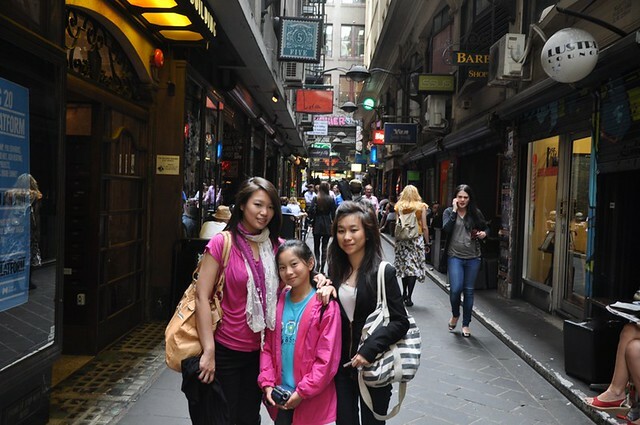 Head for the little lanes, so pleasant and filled with restaurants that reflect multi-cultural Melbourne. We had the spicy Moroccan soup (ok, but after the first sip I wished I ordered the potato leek bacon soup) and ate lunch on low wooden boxes in the fried udon place next door that gave the hawker feel. The udon, which reminded me of American chop suey, was very unauthentic but it wasn't so bad and the box fed the two of us pretty full. 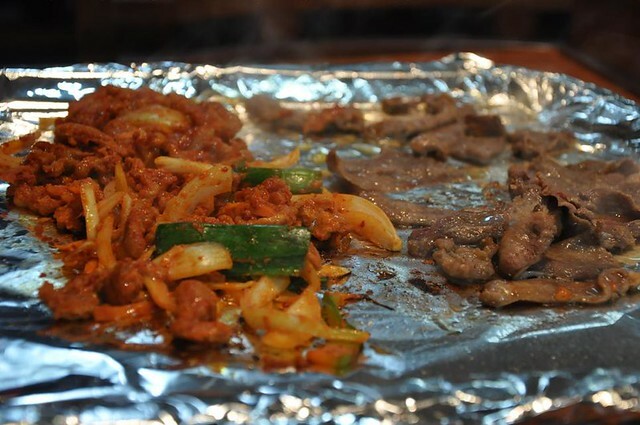 Seasoned pork and beef tongue bulgogi. Han Guk Guan is round the corner from my kids' apartment and this is where they eat occasionally, especially on Mondays when the bulgogi is half priced. Well, I think there's a catch in every deal because some of the items were not half priced (the kalbi for instance) and the portions were very small. I've never liked Korean grilled meat seasoned. They always cut the meat too fine and mix them with too much chili flakes, onions and leeks so that you hardly taste the flavor of the meat. I prefer the meat plain. I'm told the japchae and noodles here are good. 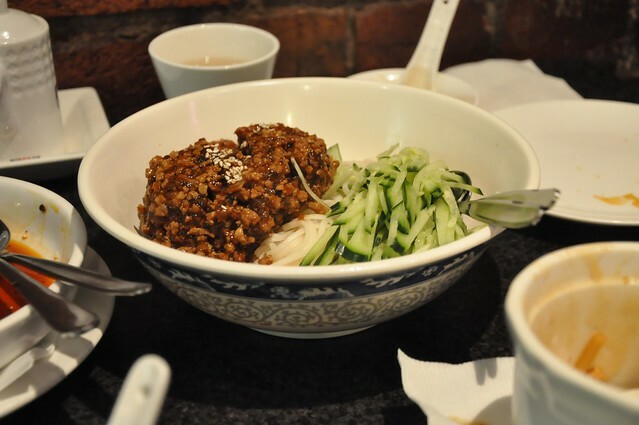 Han Guk Guan is at 13A Victoria St, near the corner of Victoria St and Exhibition St. 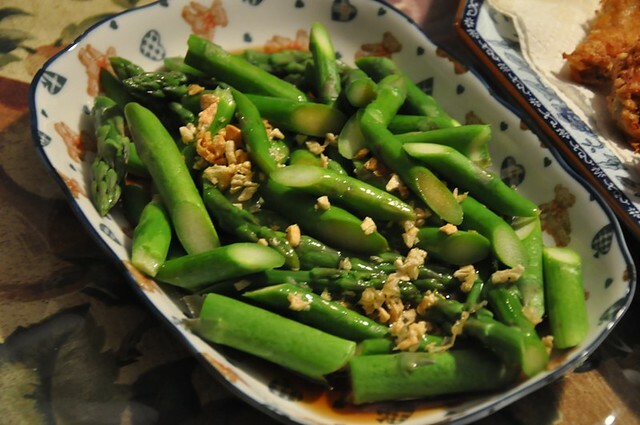 Flower Drum is the most expensive and highest rated Chinese restaurant in Melbourne, maybe even Australia. The restaurant is closed from view with blacked out windows and looks nondescript and unimpressive outside. I heard that the service is superb with a waiter assigned to each table, full attention given the minute you walk through the door. As we approached Flower Drum, we saw a stretch limo parked outside the restaurant, its driver inside waiting. 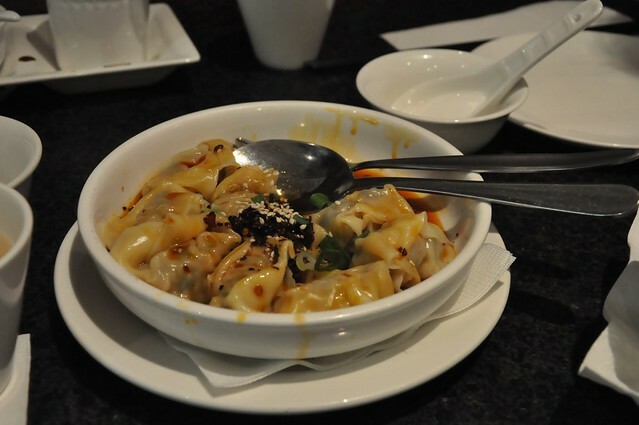 Right across the road from Flower Drum is Hutong Dumpling Bar, a restaurant for people with less money. Yi swore that Hutong's Shanghainese and northern Chinese food were authentic and affordable so that's where we went instead. 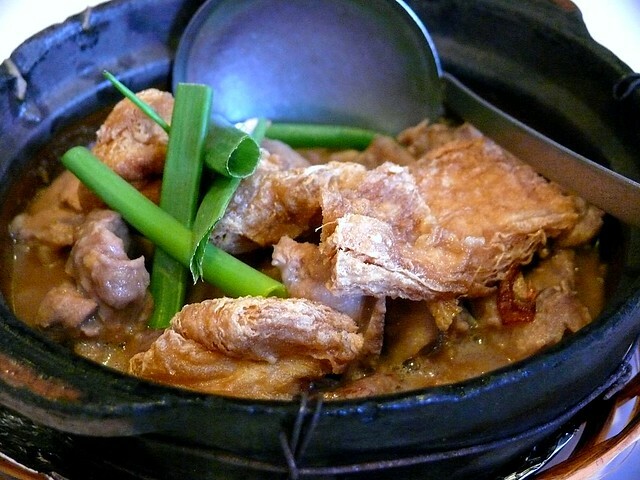 You'll have to read about Flower Drum on some other blog. The chao shou ("crossed arms', Sichuan won tons) was disappointing. The dough wrappers were too thin and soft, the meat filling too little and mushy and the chili sauce, other than hot, was sugar-sweet. The sauce also lacked Sichuan peppercorns. 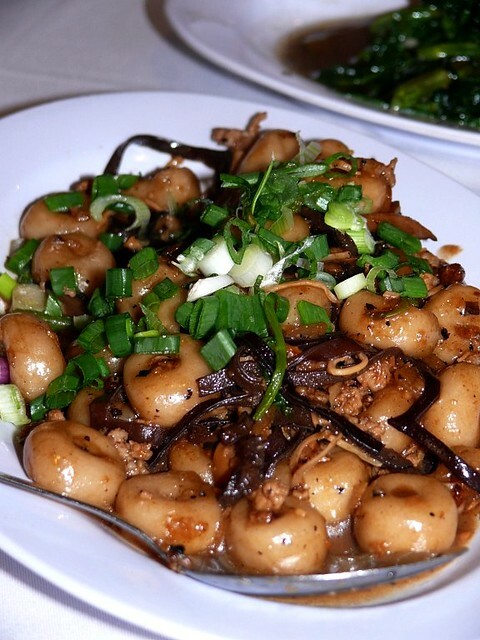 IMHO (ahem), my chao shou are way better than Hutong's. The hot and sour soup was okay, but not something I'll go back again for. Thankfully, the ja jiang mien was good. We walked out Hutong and saw the limo still parked, the driver smoking outside. We bet it was some rich guy doing his best to impress a date. p.s. I had my fill of xiao long bao in Shanghai and did not crave them anymore. It was a mistake not to order Hutong's 'little dragon baos' because that's what everybody ate in the restaurant. Wise to make reservations because this place is very popular. We didn't and waited 40 minutes, walking around the city until they buzzed us. Hutong Dumpling Bar, 14-16 Market Lane (one of the side lanes in Chinatown), Melbourne. 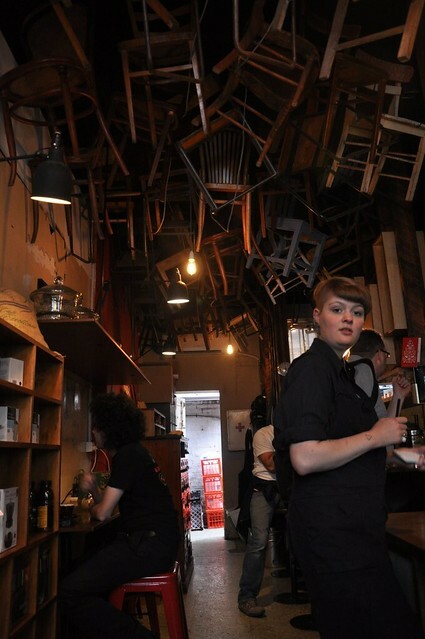 Chairs hanging on the ceiling of Brother Baba Budan. Two things Melbourne is known for: The Federation Square, an ugly building known for its...ugliness. 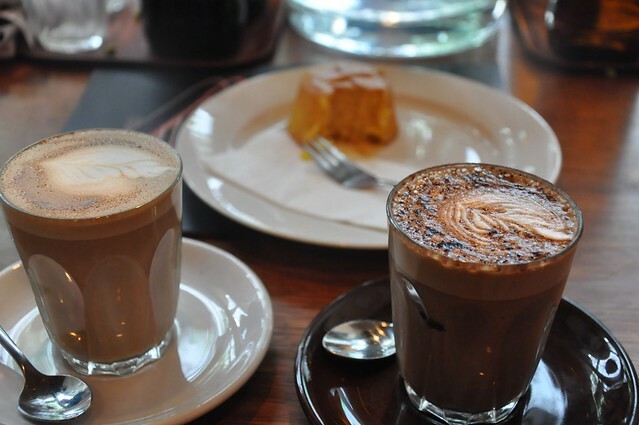 The other is the city's coffee culture and you'll know that because coffee is the first smell that hits you at the Tullamarine Airport, when the doors open to let you out into the city. My daughter, after 7 years in Melbourne, grabs a coffee at least once a day which puts her in the casual coffee drinker category. She has recently switched to chai latte which I am not particularly fond of. Brother Baba Budan sounded like a Nepalese smoke joint to me but it really is a place for very serious coffee lovers. BBB is small, dark, with seats for about 15. Wooden chairs hang overhead, threatening to fall on you (and one did once, I was told, but nobody was hurt). You have to sit on a stool and share a table with others, which is why when the first time Yi dragged me there, telling me that the place was designed by one of her tutors, I refused to go in. I am used to sipping coffee in an armchair and I couldn't understand how people can enjoy their coffee sitting on stools with strangers seated one hand span away. Snug, but not comfortable. The second time we went, the place wasn't as packed so we sat down to rest our tired feet. I drink coffee but I'm not a coffee connoisseur but one sip of BBB's coffee and I was completely rested and mellow, all my worries and problems forgotten. 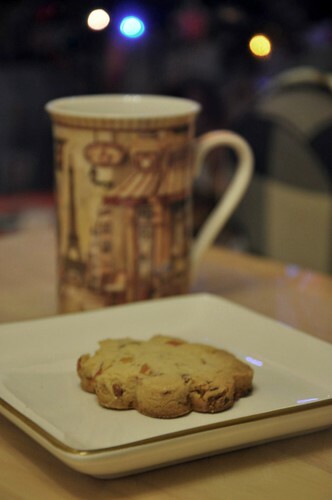 My cuppa was thick, rich, full (as against the flat, thin and sharp 'mouthfeel' of Nescafe--know what I mean? 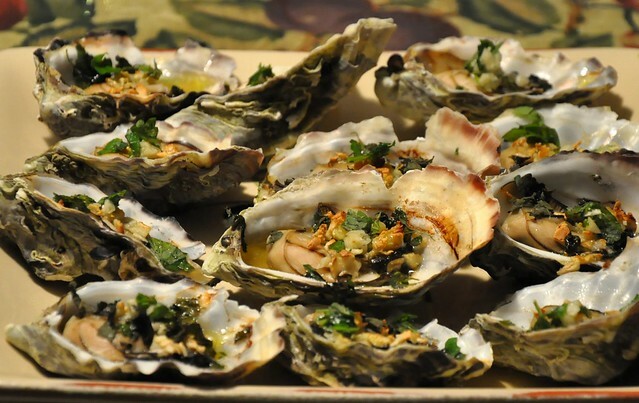 ), smooth, wonderfully aromatic. Not bitter. At all. I hate bitter coffee. Years ago when Yi came back and pooh poohed Starbucks coffee, I felt she was being snotty but on this trip to Melbourne, where we drank coffee and chai latte almost every day, I understood what she meant by "Starbucks coffee isn't coffee". And of all the coffee we drank, BBB's was the best. BBB's coffee is rated 3 stars, the highest rating. Being among the best in a serious coffee city like Melbourne means the price of a cup is not cheap, with espresso being cheapest at AUD4, and specialty coffee AUD10 and up. The handsome guy next to me came in, drank a cup, then another and then got another to go. If I didn't have to multiply the Oz dollar by 3.2, I'd have gotten a cup to go too, especially since the weather was chilly out. I hear the breakfast is good too but man, I can't imagine it being better than the coffee. 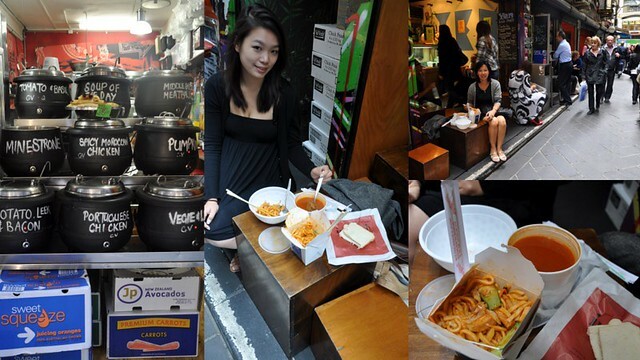 BBB is located at 359, Little Bourke St, Melbourne, next door to Chinatown. You must drink a cuppa here if you visit Melbourne. I haven't abandoned my blog. Yet. The modem died and the internet connection has been fickle and frustratingly slow. How was your Christmas? 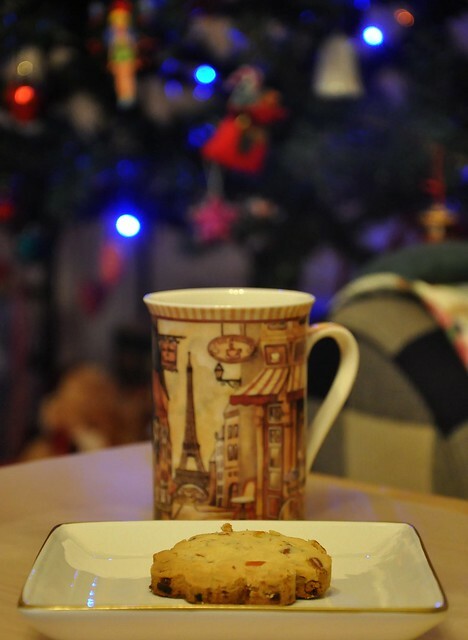 In this part of the world, Christmas dinner is usually eaten on the eve but this year, because I had just got in from Melbourne and was in a lazy mood, I decided to take it easy and had the dinner on Christmas. Since Vero was off for the day, I kept the dinner party small, with parents and siblings from both sides. Lily and Leila (who flew in from Chengdu, China for 3 days only to celebrate Christmas at our home, something she had done since 2005, she pointed out) were the only non-family guests. 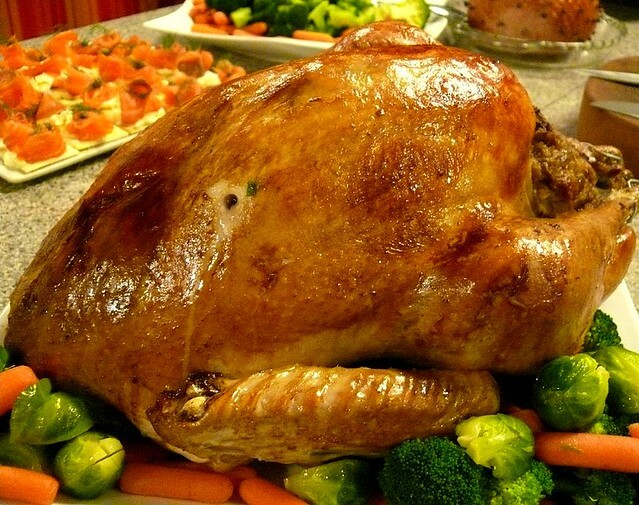 I kept the food simple, even the dessert, so I was totally relaxed, and even managed to nap away my jet lag while the turkey was cooking. After dinner, we sang carols, looked at my daughter's graduation photos (yeah) and played 'guitar hero'. The air was cool (it's been rainy every evening; love it) and fresh. 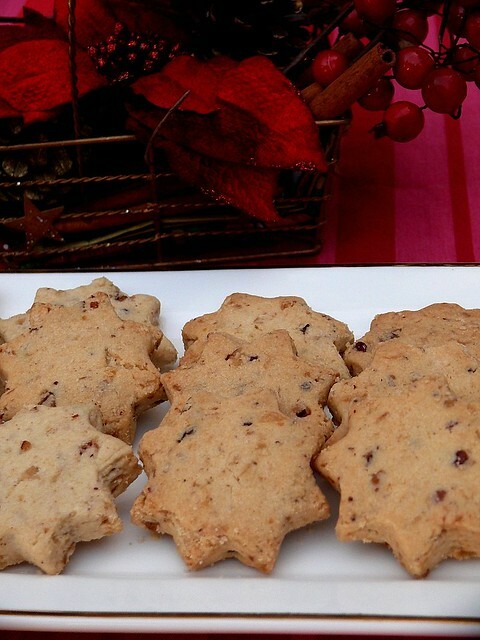 There's something about Christmas, isn't there, that makes the atmosphere nostalgic and cosy. 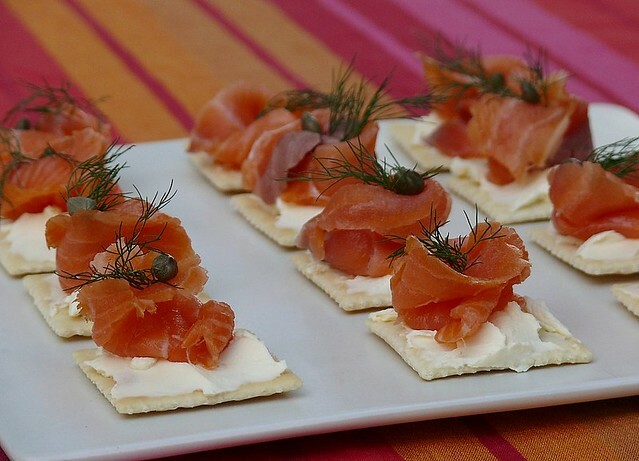 Cream cheese (dressed with lemon juice and rind) on crackers, topped with smoked salmon roses, dill and capers for a simple appetizer. The bird this year wasn't as pretty as this or this but it was just as good, at 6.5 kg. 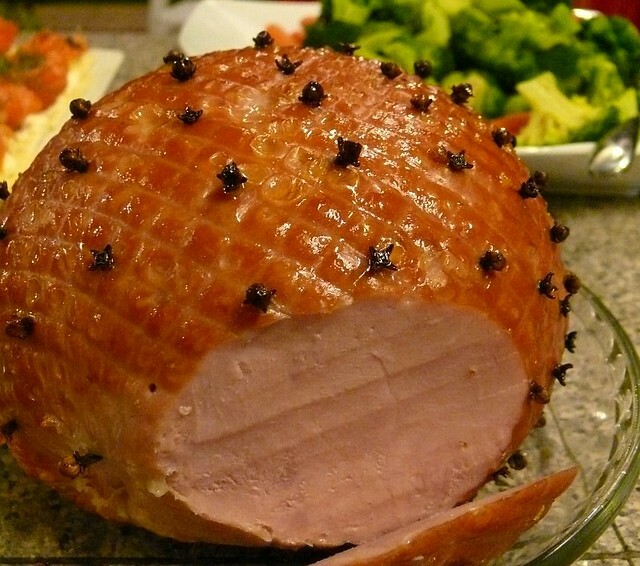 Not exactly a leg ham, but it was light enough for me to carry back. 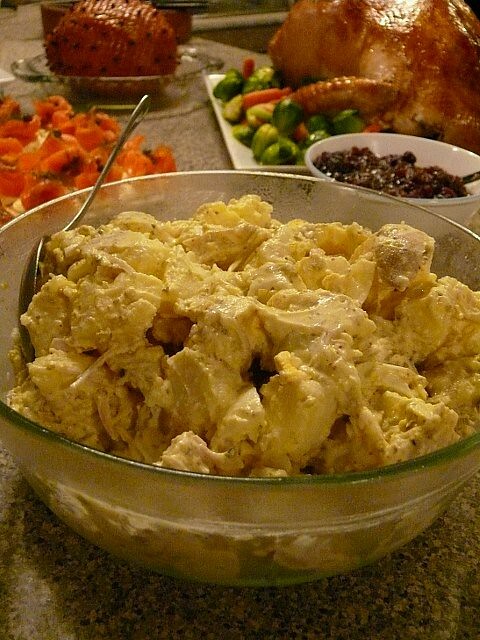 Potato salad, rather than roasted potatoes, was more refreshing in the tropics. 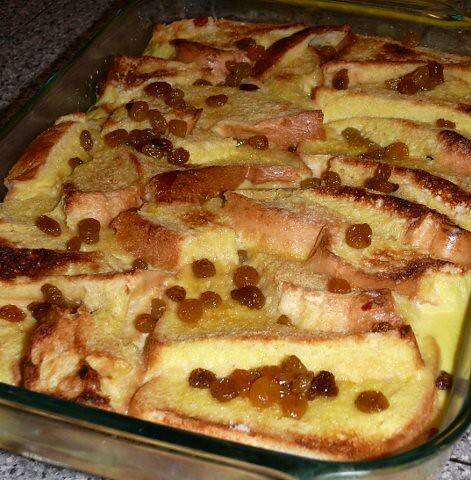 Good old bread and butter pudding, with lots of rum-soaked raisins, custardy, jiggly bread under and crusty, crispy bread on top. 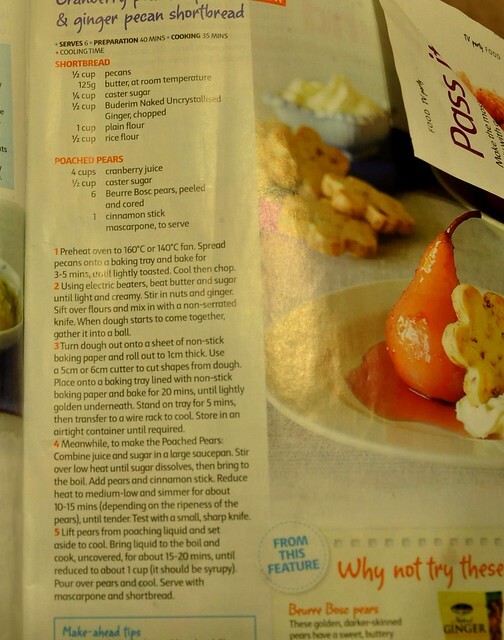 Eaten warm with vanilla ice cream and cream, this humble dessert never fails to surprise and please even the most fussy tastebuds. At the refreshment tent after the ceremony. Calling all friends in Melbourne who are free to swing by Melbourne U campus today. 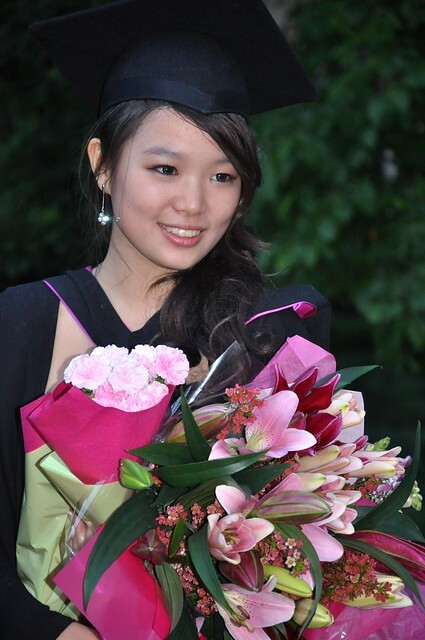 Yi's finally graduating, with a Master's Degree in Architecture, after 1 year of foundation, 3 years of bachelor's studies, 1 year of work and 2 years of grad studies (read: a lot of money and time spent). She doesn't want to invite anyone because she knows most people are working. When I asked for phone numbers of my friends (which she keeps in her phone) she was very evasive, finally telling me yesterday that her phone is ruined after a week-long trek in the Tasmanian wilds last week. I'd like to invite Simon & Margaret, Emily & Chris, Leon & Vero, Betty & Thomas and all our friends (I don't have your numbers) who can make it before the ceremony (before 5:30 when they file into the hall or after 8 pm when they go out), to come take a photo on this happy occasion. I do have two extra tickets to go into the hall but graduation ceremonies are boring, more so for the masters and phDs students who are the last to be conferred. Haven't been in Melbourne in 3 years and have forgotten how lovely this city is! It's safe, clean, beautiful, not too big (Sydney) or boring (Perth/Brisbane) and right now the weather's cool, about 17 C but wet. I'm here for my daughter's convocation this Thursday evening, and for the first time in 7 years she is totally free to spend time without rushing for an exam or assignment, so we are just walking, shopping, eating, babbling and enjoying the city. On Sunday we slept over at my friend L's house in Doncaster. Doncaster and Boxhill are the places where all the Asians live but unlike the Asians enclaves of old, these are nice residential areas chosen for their proximity to good schools. L and family moved here just 2 years ago and L's kids are doing very well in school. Daughter M is like a different person, speaking in Oz English and taking the bus on her own. Back in KK she was waited on hands and foot and was rather spoilt but now she's a beautiful, confident and happy kid. I remember how every time I visited them in the evening, she'd be doing Chinese and Math homework, her mom stressed out from teaching and shouting. But here M is doing better than ever, was the White Rabbit in her school play, is very popular in school and when my daughter went with her to hand in some forms for her entrance into high school next year, she did all the talking and handled everything without any help. Her sister S too is doing very well (although coming here as a high schooler she had a harder time adjusting) and just got one of her exam results on Monday, scoring very high and surprising even herself. Both girls told me that school here is fun, the teachers helpful and encouraging, never mean and authoritarian like the teachers back home. Learning science is very hands on, with a lot of lab work (my son Wey has not done a single lab experiment on his own and he's in a private school. This whole year, the only lab experiment he had was watch his schoolmate dissect a frog. Four kids, four frogs for a class of fifty). Teachers don't teach from the textbooks, they teach from their heads and students take notes and refer to textbooks on their own. Learning is exploring, interactive and relaxed. Classes are small , 27, compared to the average class size of 50 back home. I am left envious and wishing that I had given my youngest that opportunity. The thing I would miss, if I ever moved here or anywhere is maid service. L used to keep a house where everything was perfectly in place. Now I see baskets of clothes, boxes here and there and I resisted the urge to fold the clothes. The maid used to wash up while we had coffee. Now everybody pitches in. It was strange to see the familiar furniture, tableware and other items that I used to see in L's former house in KK now in her house in Melbourne. I can't explain it, but I felt sad. Maybe because I know that the good times I had in her house in KK can't be had anymore. It's the feeling of how moments and phases of life can't be repeated. And it doesn't matter if you enjoy yourself to the hilt because every good moment passes. I also don't like how my skin is all wrinkled and dry. I can't recognize myself in the mirror. The air is so dry that when I get up, my eyebrows are crinkled from being pressed on the pillow; it takes water and a brush to straighten them. 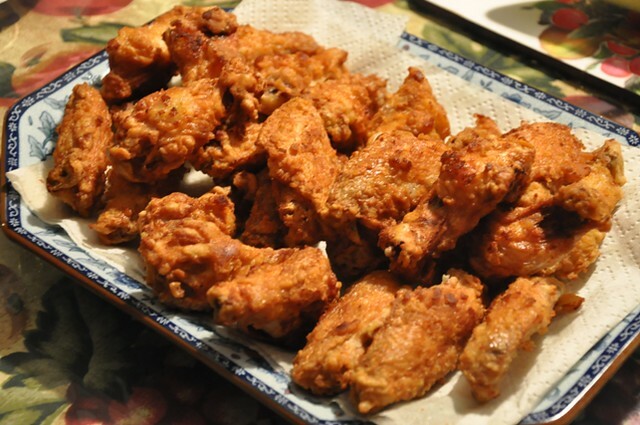 This is shake and bake Korean KFC, very tasty and crispy. I must make space for a packet of the seasoning flour in my suitcase. We decided to get back to the city as soon as the parents went off for work, and took the two girls with us. M and S have grown into such beautiful, wonderful kids. 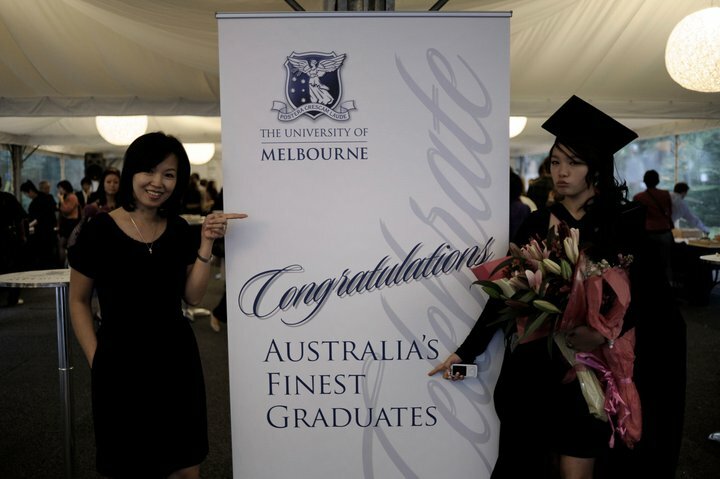 Yi and I both agree that the painful decision her parents made to come to Australia was worth it. 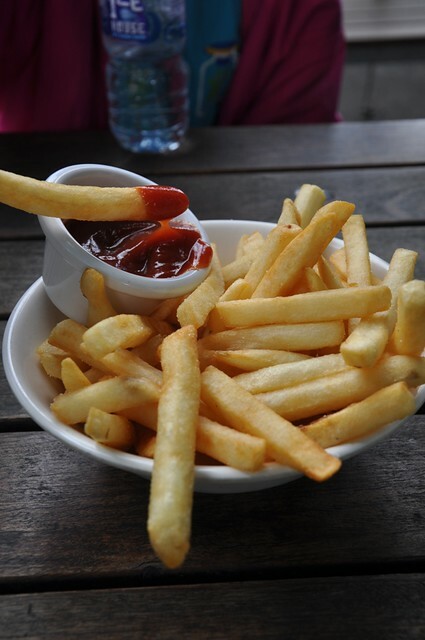 One thing that never fails to please is Australian fries--always fresh, meaty and yummy. 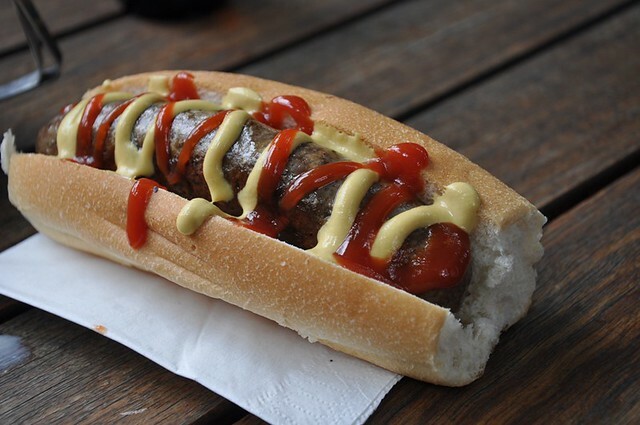 Very 'home made' sausages, with chunks of meat, AUD8 each on a bun. We tried different ones--duck, lamb and beef--and I still prefer beef. This was at a restaurant by the Yarra river. Melbourne has many nice little pedestrians-only lanes that are crammed with cosy cafes and boutiques. 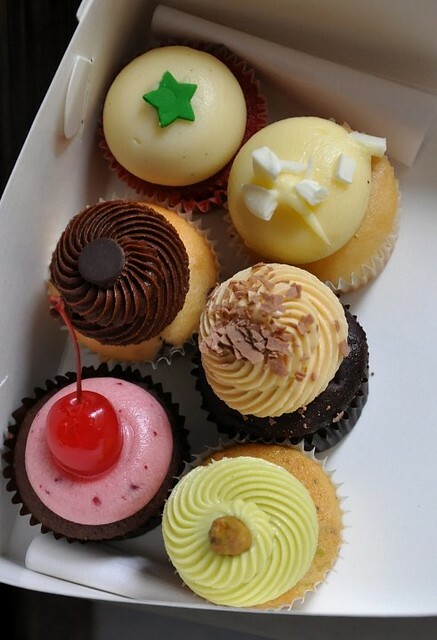 We had a selection of mini cupcakes (AUD2 each) that were moist and delicious. The best one was the red velvet cake (the one with a green star). 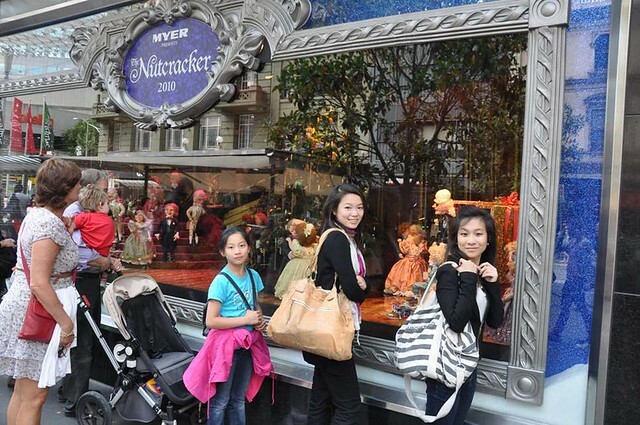 Myer is one of the big departmental stores and its Christmas window decoration is an attraction and for many families it's a tradition to bring the kids out (long lines in the weekends) to see the decorations. Sai Gong is the typical air-conditioned family budget restaurant: harsh fluorescent lights, plastic chairs, white tablecloth and unfriendly waitresses. Families with noisy small children. Groups of men binging on beers. Not exactly very convincing setting for a restaurant my friend said was "probably the best in Kepong". And then the food came and all my misgivings disappeared. Look at that. 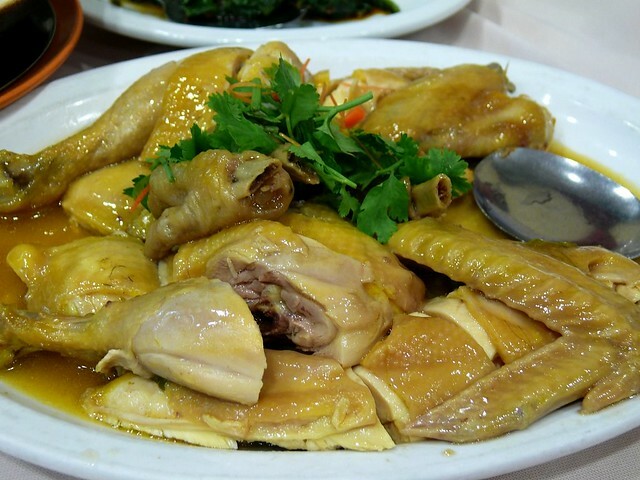 Moist, savory-sweet and flavorful plain-boiled chicken. I could eat it all by myself. 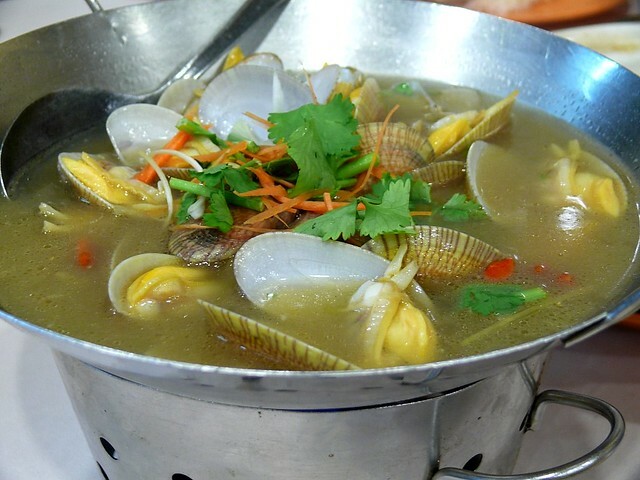 This was divine, clams in wine and superior soup. 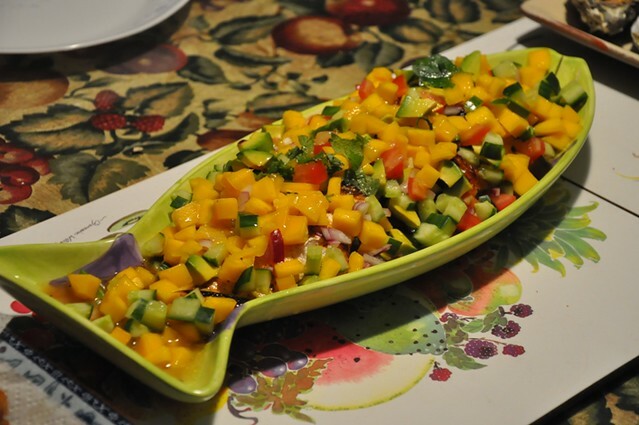 Another dish that I wanted all to myself. 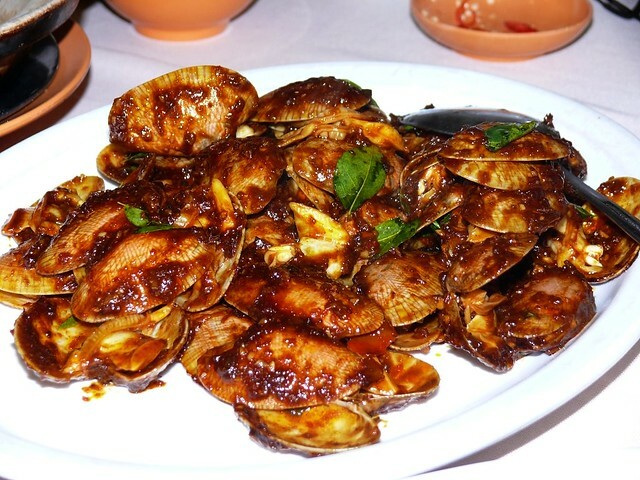 Our host liked the plump juicy clams so much that he ordered it fried in a hot sauce but I thought the sauce over-powered the delicate clams. 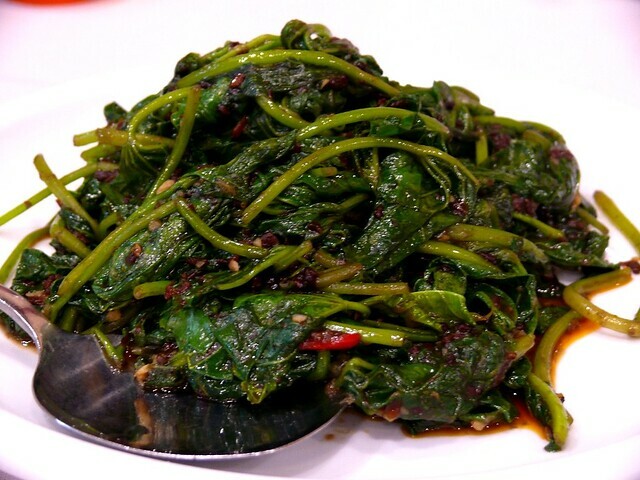 Stir-fried sweet potato leaves with blacan (shrimp paste). Delicious. 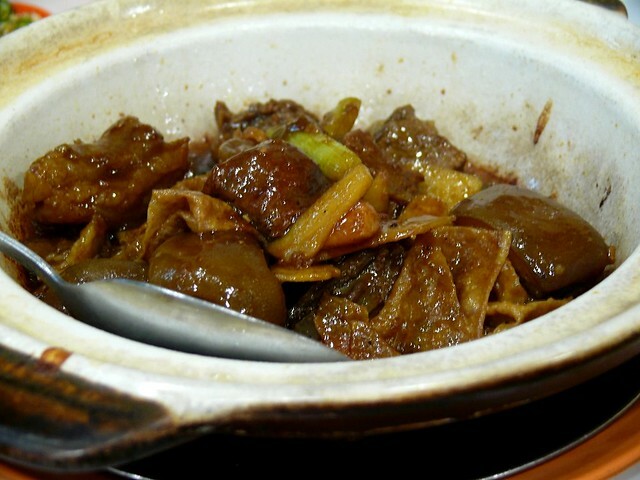 This claypot of greasy lamb stew was a big mistake. Have you ever eaten lamb skin? Yes, it was gross. 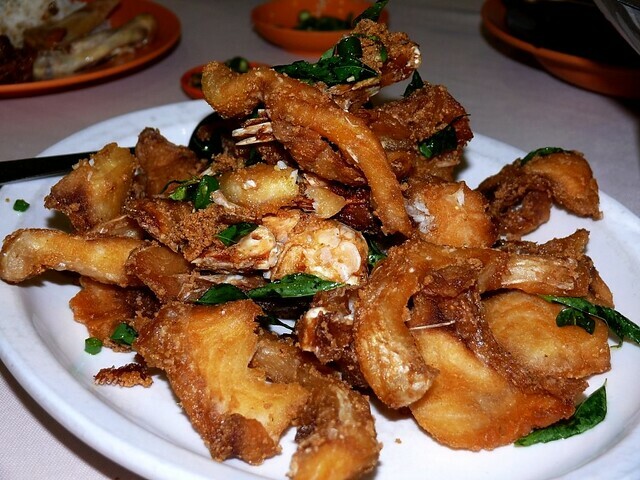 Deep-fried tilapia. I didn't like this at all. Give me steamed fish anytime. 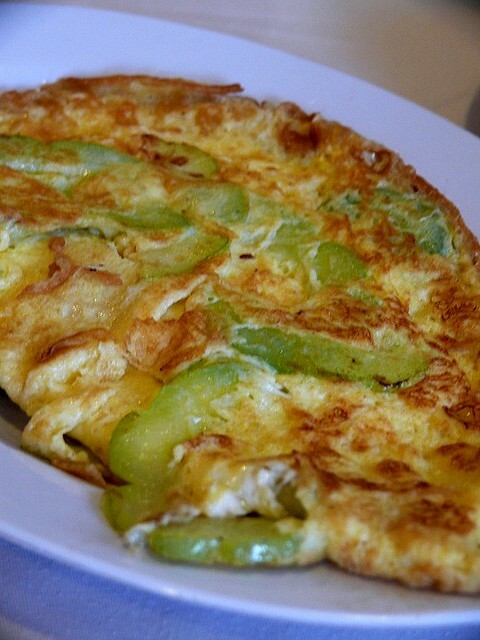 This could've been fried anything; it just tasted fried, that's all. 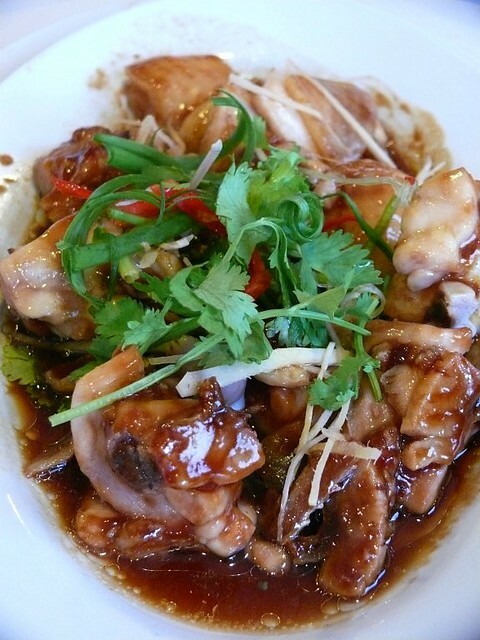 I'll love to return to Sai Gong to checked out their other dishes. Only this time, I'll do the ordering. 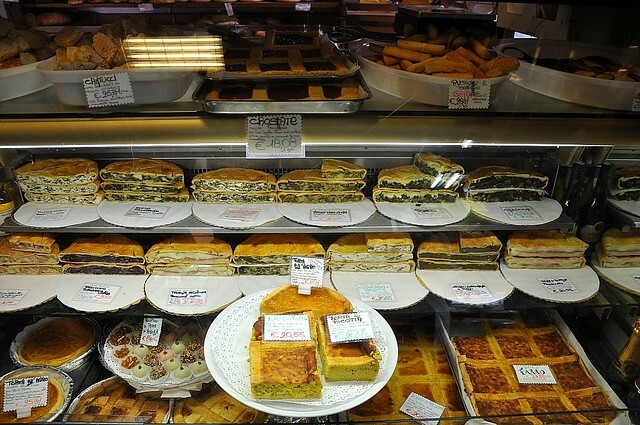 We had a choice of going to the most famous Roman market, Campo dei Fiori, or to Volpetti, a fine foods store recommended by Europe expert Rick Steves. Unfortunately, I chose Volpetti because it was late when we got ready to go (and I didn't know that the market in Camp dei Fiori lasted through the day) and I thought the Testaccio market next to Volpetti wouldn't be much different from that in Campo dei Fiori. 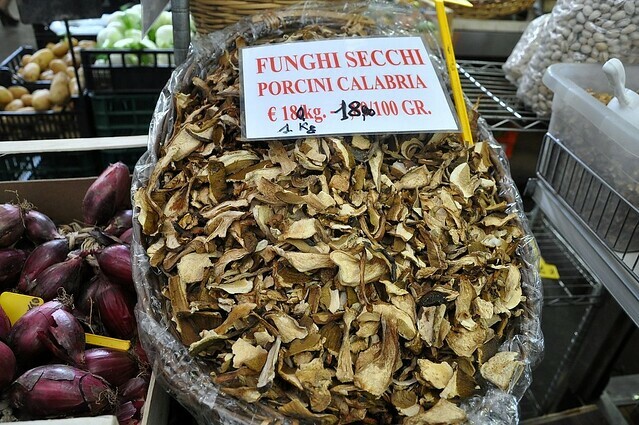 I was wrong, because the Testaccio market was small and Volpetti, although a wonder store, was overpriced. We preferred meat suppli to rice suppli. Pizza rossa (tomato pizza) is lovely but I found Volpetti's pizzas not as good as those in the regular pizza shops. Pizzas in shops are usually sold by weight. On the left, toppings were anchovies and zucchini flowers and on the right, potatoes. Superb flavors! 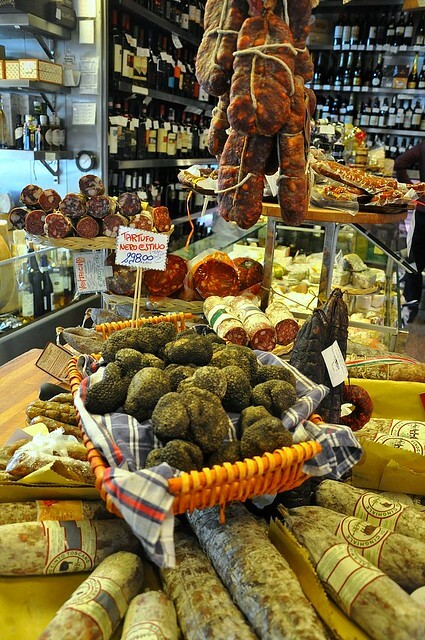 We spent hours in Volpetti, picking up parma ham, black truffles (I bought two only for about 30 euros each; Hub was to bring them home while I stayed back in Europe for another 6 weeks), truffle salts, a couple of cheeses and unusual canned food. 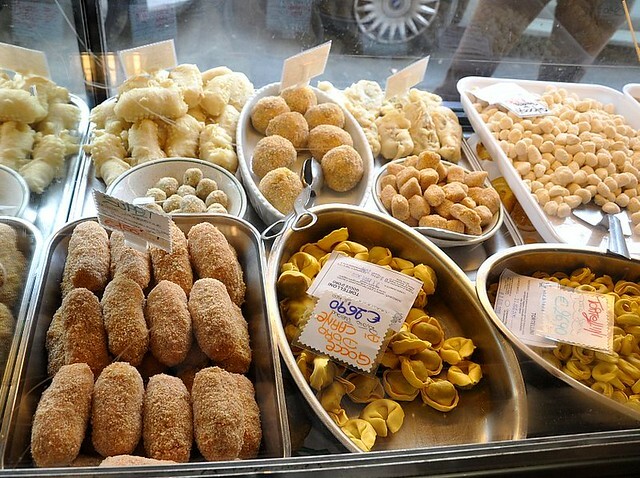 After the damage to our credit cards, we walked by the Testaccio market again (only 1 block away from Volpetti) and I realized that everything we bought in Volpetti was more expensive than those in the market. 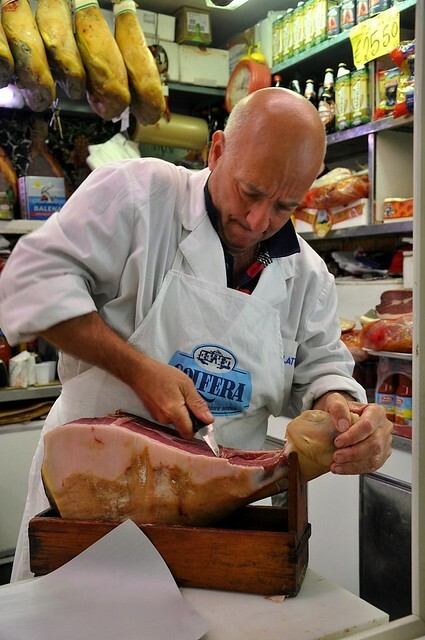 The prosciutto hams especially were much cheaper and the locals all shopped in the market. They seemed to prefer prosciutto crudo instead of parma. I sampled both prosciutto crudo and parma and couldn't tell the difference. I must tell you about the salami. Since I wasn't very familiar with cured meats, I bought two kinds of salami, one with a white coating and another without. The salami without the white coating was excellent, fresh, sweet and wonderful but the white one was too hard and strongly flavored. If I knew that salami can be so tasty, I would've saved all my luggage space for it. I also picked up excellent grana padano, pecorino and Parmesan in Pisa, my port of exit. The grana padano especially was surprisingly savory-sweet and smelled fantastic, without the stink of baby vomit like the ones we get at home home. Good grano padano is only about 9 euros per kg in Italy and it was an Italian in Pisa who told me that a good grano padano is just as good as any other fancier Parmesan. That was quite a tip for me. 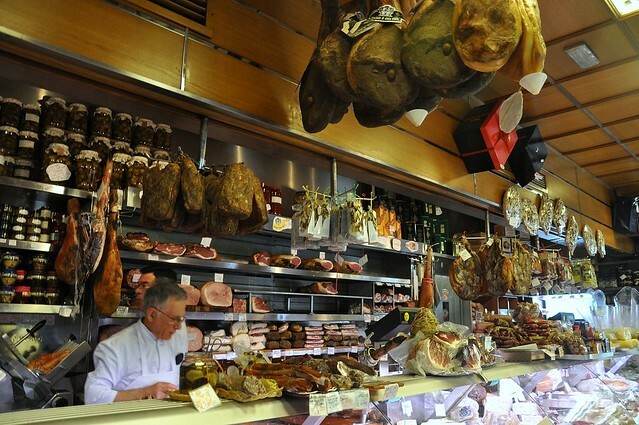 The cookbooks always tout prosciutto parma and parmigiano reggiano but the Italians themselves use proscuitto crudo and grano padano, which are cheaper. 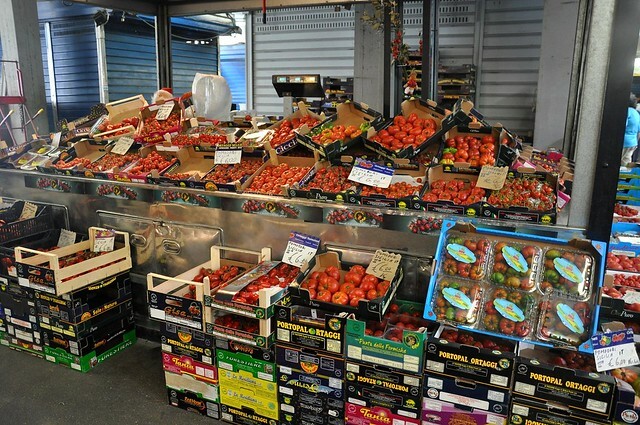 Tomatoes from Sicily are the best, I was told, and this stall in Testaccio market sold only Sicilian tomatoes. I asked for the best, and the friendly Italian guy gave me a couple to sample. So sweet of him. 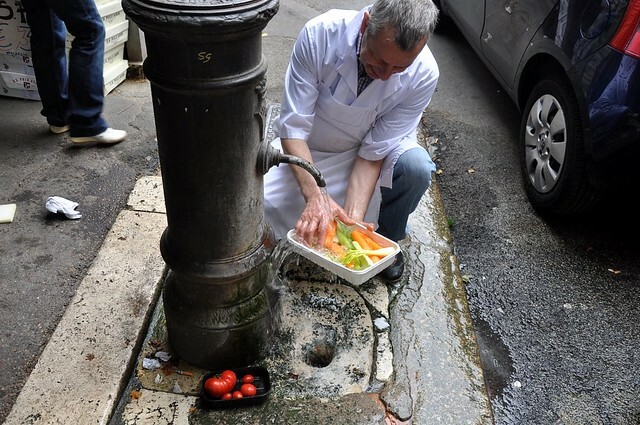 I love the fountains in Italy where you can drink from and wash your fruits and veggies. I bought enough to last me a year or two. 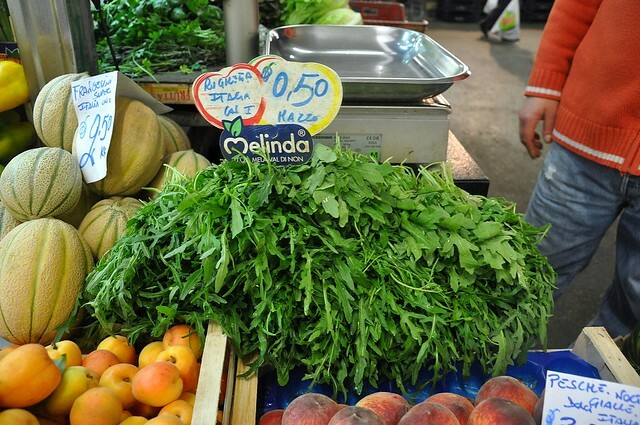 Did you know that rocket (arugula) grows wild in Italy? 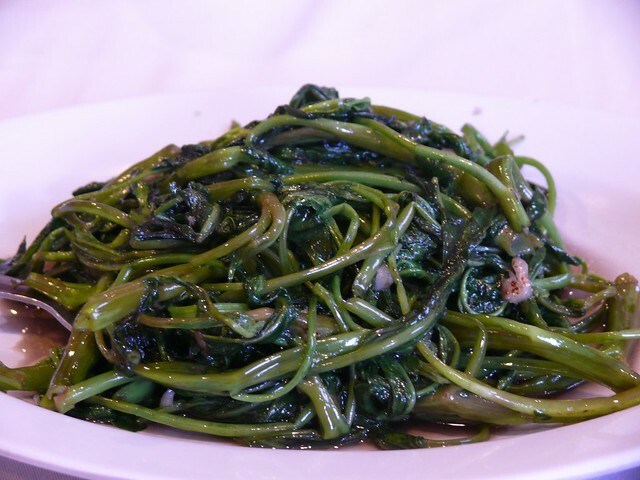 Seems like the only Italian veggie we hear and read about is rocket but, just as in China, there are so many other types of veggies that we don't know about. Poor guy had to hand cut (I preferred thicker slices) 3 kgs of proscuitto crudo for me. I left Italy with 5 kgs of prosciutto, 1.5 kg of sun-dried tomatoes, 1/2 kg of dried porcini, 3 kgs of cheese, a couple of salami,1 kg of pancetta, a bottle of limoncello, a bottle of vin santo and 4 jars of white/black truffle salt. 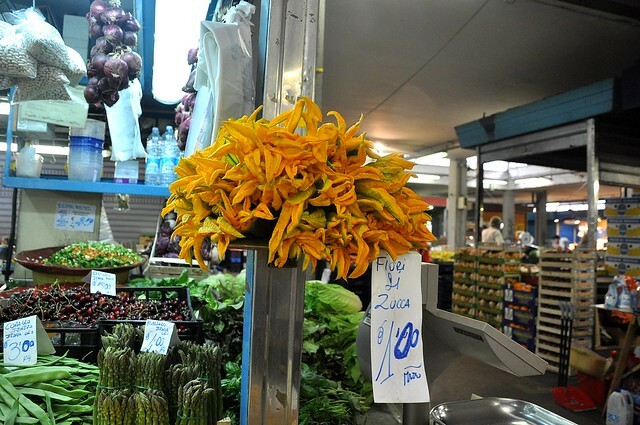 If you want to visit a market in Rome, make sure it's the one at Campo dei Fiori. 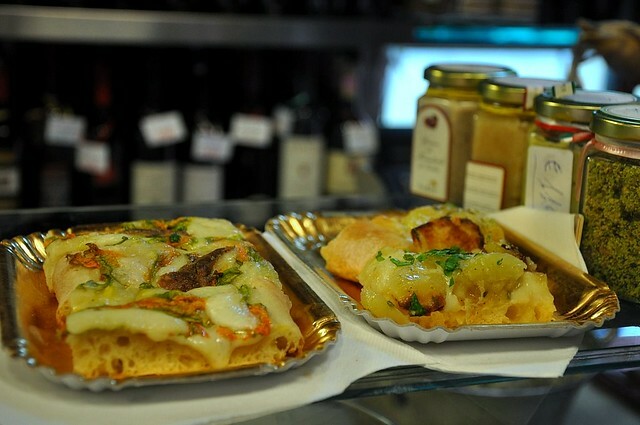 I hear it's as good as La Boqueria, if not more lively, because Campo dei Fiori is an open piazza.